This giveaway is now closed. The three winners were: Kimberley Cartin of Halifax, Mrs Edmunds of Nottinghamshire and Monika Kos in Croatia. Today’s post is happening a day earlier than I’d planned. The review of this book will follow tomorrow but in the meantime you have an extra day to enter this giveaway! 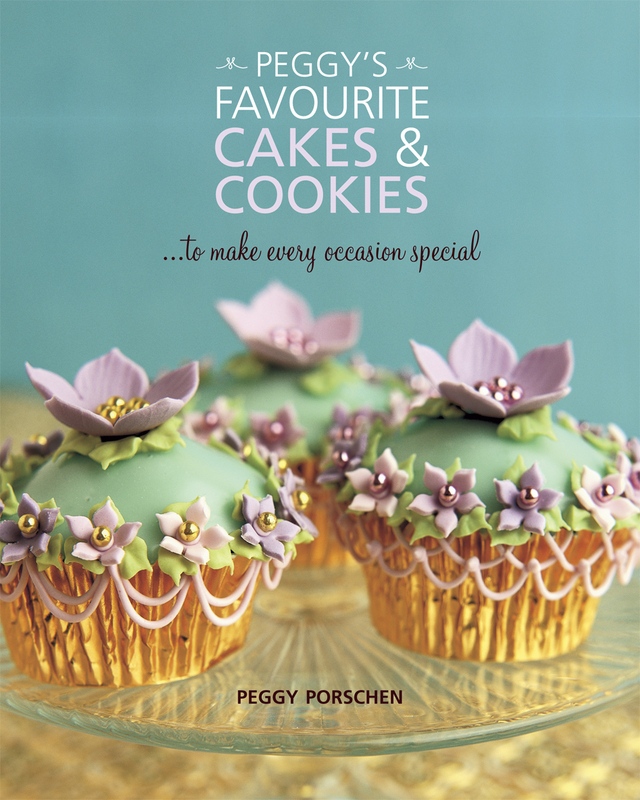 Today I am delighted to give away three copies of Peggy Porschen’s latest book Peggy’s Favourite Cakes & Cookies published by Quadrille from June 6th 2011. This book is a compilation of Peggy’s favourite things previously featured in her first two books, Pretty Party Cakes and Romantic Cakes. I will be reviewing this book in more detail tomorrow but suffice to say it’s full of the gorgeous cakes, cookies, fondant fancies and large wedding cakes I’ve mentioned already in my posts this week about the Peggy Porschen Parlour and Peggy Porschen Academy. There is one mandatory way to enter this giveaway and several ways to get bonus entries. This giveaway is open to readers based in the UK and the EU. The winner will be chosen using an online randomiser and announced in a subsequent post on this blog. 1. Mandatory. Leave me a comment to tell me if Peggy could make you any cake you liked, what it would be? 2. Second chance to win: subscribe to Maison Cupcake updates by email using this form and leave a second comment saying you’ve done so. N.B. You must leave a further separate comment for each bonus entry otherwise they cannot be selected in the draw. Closing date: midnight BST on Sunday 12th June 2011. These are the terms and conditions of this giveaway, if you do not like any aspect of them then please do not enter. The winner will be notified by whichever email they register their comments below this post. If the winner does not reply within 7 days, a new winner will be drawn. Please reply promptly to ensure we can make arrangements for Quadrille to despatch your book. The winner will be chosen by an online randomiser and approved by Quadrille. The winners’ names will be announced at the top of this post once they have responded to confirm they accept their prize. This prize has been chosen in good faith and is expected to be available at the time of the draw. There is no cash alternative for this prize and no correspondence will be entered into. Participants must be aged over 18 and live in the UK or EU. Quadrille’s decision is final. Prize sponsored by Quadrille books. Definitely I will choose black forest gateau:). I have joined your mailing list. A simple yet lovely victoria sandwich cake for me ! A wedding cake? I’ll have to get A to propose mind but he may be tempted with a Peggy cake! Cheers Sarah! I would just love a Rich Fruit Cake. Now that would be simply delicious! I have also joined your mailing list. I would love tiered chocolate cake, there is a lovely butterfly one in romantic cakes which is brown and blue – looks super! – top – a chocolate cake with a chocolate buttercream filling!!! All my favourate cakes in one!!! I have tweeted and shared on facebook too!!! I love carrot cake, especially if the icing isn’t too sickly! I love all of Peggy’s creations from her books. I would love to win this book. I would love her to make me one of her iconic anenome cakes, i’d like a suprise flavour inside as I’m sure whatever it is would be delicious. I’ve just signed up for your updates too, look forward to receiving them! I would like any cake made by Peggy ofcourse! I would have her make The Gift Box Cake as I could really use a lovely cake for my daughters 18th soon. I would love a “not-so-christening” cake, we are having a day to celebrate baby G’s arrival but not a christening and a Peggy creation would be fabulous. I can only imagine how beautifully it would be decorated! Oh what a question… – think I’d have to go for some sort of rich chocolate cake decorated with her amazing sugar flowers! A really rich and moist chocolate cake. Have subscribed to your newsletter and tweeted @ratties2. This woman is a legend. I’ve never seen anyone else who makes cakes to such levels of detail and skill. It’s my 40th birthday next year and I would be happy with anything made by Peggy Porchen. Perhaps a crisp, white tiered confection with chilli red and lime stripes and her gorgeous matching trademark flowers. Signed up to email too. Does it have to be a type of cake? Because if Peggy could make me a cake, I’d want it to be my wedding cake as her cakes are so stunning, I wouldn’t even care what was on the inside! A lemon cake with pink roses. Hmmm, a cinnabun, dripping with cinnamon sauce…. I think it would have to be a carrot cake! I would love to taste an orange flavored cake of Peggy… yummmmy… I’m specially tempeted by her Fancies. Too bad that I’m not enlisted to the giveaway, as I live in Brazil. I would love something simple but elegant for my wedding anniversary. Love lemon !!! Hallo Peggy, If you could make a cake for me… well I would let you choose, to me your cakes are all beautiful! I subscribed to the Maison Cupcakes Newsletter! I am a big fan of raspberry – so a white chocolate sponge filled with vanilla cream and fresh raspberries would do me just fine! oh yes, I have subscribed!! 1. if Peggy could make you any cake you liked, what it would be? I would love a coffee cake, but it has to be without nuts as I’m allergic to them and mostly I only find coffee & walnut which of course I can’t eat. I would love Peggy to make a cake for our old ladies tea parties, they couldn’t moan about that!!! If it was any cake it would have to be gluten free and totally chocolatey. I signed up to the newsletter too. anything chocolate! dark chocolate with raspberry would be lovely! Mmmmm anything with chocolate and coffee. Or chocolate and marshmallow. Or chocolate and caramel. Hmmm where is this going? Pretty book! Wow those cakes on the cover look amazing!!! I would love her to make me any cake but a nice chocolate orange with beautiful gold decorations would be lovely! I would love a lemon flavoured sponge, they are my absolute favourite! After visiting Peggy’s bakery, I would love a lemon chiffon cake for my birthday next week! I’d love a lemon cake. And if it could be decorated in her gorgeous pink and brown style with delicate piping it would be almost too beautiful to eat! I’d like Peggy to make me a croquembouche. I would like a gluten free cake that actually looks and tastes really nice! I’d like Peggy to make me a strawberry cheesecake! and I tweeted the comp! Frankly Peggy could make me do the washing up whilst she sat with her feet up and I’d be happy, but I’d be delighted if she could make me a perfect Victoria Sponge, decorated with her exquisite roses and I’d be in 7trh heaven. If Peggy could make me any cake I’d like on with a fresh raspberry filling and white chocolate decorations along with some beautiful flowers then I’d have a girly tea party for all my friends. Wow what a lovely giveaway! This is a Cake Makers dream… That’s me then. I would love for Peggy to make me a Chocolate Raspberry Ruffle Cake. I have not had the pleasure of tasting it myself but I had heard it’s delicious and looks amazing too. But I have to be honest: any cake she makes would be fine by me! I would just love her to make me a gorgeous, dainty 3 tier birthday cake. Her cakes are so pretty! I’d love Peggy to make me a wedding cake – I’d choose chocolate everyday, but the fiance wants fruit! I would love chocolate and walnut brownies, they are my all time favourite!!! I have subsribed to your updates by email. And I already subscribe to your newsletter! Sadly I don’t do Twitter, so can’t enter a third time… maybe one day I’ll join the tweet-o-sphere! I have subscribed to your news letter. 2nd chance ! I would love her to make me a lovely lemon cake with a cream filling. If Peggy could make me any cake, it would have to be a Concorde cake. I use to order one every year for my birthday, back in Australia. I’ve been in the UK for five years (and five birthdays) but I’m yet to find a cake shop that make the Concorde cake. IT’S BEEN 5 YEARS SINCE I HAD A CONCORDE CAKE!!!!!! Definately a rich chocolate cake decorated with lots of pretty flowers! Just subscribed to your newsletter via email. It’s a tough question because I love cake and fondant and pretty twiddly bits. However, I would really like Peggy Porschen to make me a sublime coffee and walnut cake because they are my favourite. I would like the walnuts on top to be hand modelled and maybe some cocoa beans too. Could you please arrange? Thank you. I would love that Peggy make me a ballroom piano cake, i know would be a piece of art. I already follow you by email. I’d love Peggy to make me a oconut and strawberries cake :). I think that would be very interesting, oh yes and decorated with my favourite flawores “ranunculus”. And I subscribed via email. Lemon drizzle cake would be great. I’d love Peggy to make me a egg sponge filled with fresh cream and strawberries. It’s the cake my Mum always made me for my birthday, once I was past the novelty cakes. I’ve never been able to make that ‘fatless’ sponge and it is just so delicious. I’ve subscribed to updates by email 🙂 Thanks for the chance to win this book. I’d love her to make me a sponge wedding cake – I really hate fruit cake! Plus she’s got the eye for beautiful but not “in your face” decorating. Timeless elegance! I would love for her to make me one of her signature brown and pink spotty cakes with chocolate sponge. I would love her to make my wedding cake. It would be a 3 tier wedding cake. One layer would be a simple vanilla sponge. Another one would be a chocolate cake and the 3rd one would be red velvet. Of course the decoration would be out of this world. I’d want Peggy to bake a summery cake for me – something with cherries I think! I would love Peggy to make for me a lemon scented cake soaked in lemon syrup, with lemon icing and topped with her beautiful butterflies and flowers. I’d love a coconut-lime cake..so tastefull!! I’d love Peggy to create a cake using elderflower! I lvoe elderflower but there aren’t many recipies using it in proper cakes! I love a chocolate cake with some kind of unexpected twist! I would love Peggy to make me a wedding cake covered in sugar peonies! Her sugar flowers look so real it’s incredible. Carrot and chocolate cake – healthy and unhealty at the same time. I have subscribed to your blog – can’t wait for the next update! I love a victoria sponge with lots of strawberries on top. A toffee & pecan cake would be amazing! I’d love a carrot cake! id like her to make a lovely coffee and walnut cake my favourite! Neither my partner nor my teenage son like coffee cake and it’s my favourite so I would like peggy to make me a gorgeous coffee cake of her choosing and I would eat it all myself – YUM! I’m addicted to chocolate so it would be a three tier chocolate.. fudge cake at the bottom, triple chocolate in the middle and blackforest gateau at the top..yummy! I would love Peggy to make me a cupcakes that includes my favourite things; chocolate, caramel and cookie dough! I would love a chocolate fudge cake! Tricky choice…. if I could get her to make me ANY cake…. probably a layered sponge with mixed fruit, jam and fresh double cream. I would like a cake that doesn’t make me feel guilty so something healthy made with vegetables which still tastes like I am cheating. I’ve tweeted about the giveaway @googoodoll83. Black forest Gateau cupcakes would be different and taste fantastic. Chocolate cake with a picture of my baby on it. I would love Peggy to make me an authentic Sachertorte. Already subscribed to Maison Cupcake updates by email. I would love something really chocolatey and scrumptious…it doesn’t really matter what as long as it’s chocolate! chocolate cupcakes with an oozy chocolate centre 🙂 choco heaven! I have just sat for ages looking at the cake in the first photo – so pretty! I would have one of those definitely. I am a bit rubbish when it comes to decorating cakes, mine are all lop-sided and wonky! This book looks great! What about an eton mess themed cupcake? Red Velvet Cake, I’ve never tried it and really would like to! Hi I would love peggy to make me a 2 tier all white cake with white flowers something simple buy cute. It would have to be my wedding cake as I get married in october and Id like toffee flavour as I have a very sweet tooth! I love black forest gateaux with fresh whipped cream. Hummingbird cake with fresh pineapple! I love all cheescakes, so would be happy if Peggy make me any cheesecake. Coffee and Walnut Cake – yummy! I would ask Peggy to make me a really moist chocolate cake! Soooo yummy! I have subscribed to Maison Cupcake updates by email! Cupcakes – I LOVE <3 cupcakes! I’d love Peggy to make me a gluten free coffee and walnut cake please – yum! Have just subscribed to Maison Cupcake. A lovely, moist carrot cake with sof frosting on top. Signed up to email mailing list!